Have you ever felt like you were going to blow a gasket? Not that I know what a gasket is exactly, but I know it’s in a car engine and if it blows, it’s not good. If you blow your engine, you can rebuilt it. But if your head explodes? That’s a messy, done deal. Apparently I’m under a lot of pressure—which is odd because I’m not overly stressed. I’m reasonably calm and exceedingly happy most days. I think somebody needs to tell that to my blood pressure. Hyptertension runs in families. It happens to run in mine. 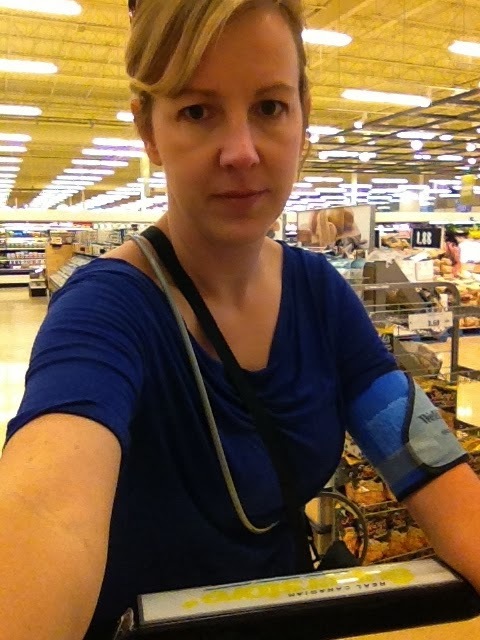 At my last appointment my doctor ordered a 24 hour ambulatory blood pressure monitor. If I failed the test, I agreed that I would medicate. The tech at the Cardiologist’s office hooked me up. The cuff inflates every 20 minutes and takes a reading which is recorded on a device in a bag (sadly, not Kate Spade) slung around your neck. At the end of the 24 hours the cardiologist averages out your results to get a general profile of your blood pressure on an average day. An “average day” …. this means you are to carry on about your daily activities as usual. For me this meant I should go grocery shopping as planned. Before hitting the grocery store, I stopped at the Dollarma. As I stood in line to pay, I heard the beep and knew the cuff was about to inflate. In order to get a proper reading you must stand perfectly still with both arms hanging still at your sides. The cuff began to inflate. I took a breath and stood very still. The person ahead of me moved up to pay but I remained motionless. The woman behind me sighed loudly. I stood like a statue. A beeping statue. She sighed again. God forbid there should be an 8 inch gap between me and the customer ahead of me. The cuff deflated and released my arm from its crushing boa constrictor grip. The machine beeped and read “ERROR.” I suspect I was clenching. The smallest movement can throw it all off. I turned and glared at the impatient person behind me. I made sure she saw the monitor on my arm. Then I stepped forward, closing the “offending” gap. My next stop was the grocery store. My shopping took forty minutes so the cuff inflated twice while I was there. The first time I stood still like a solider at attention in the dairy aisle. The second reading occurred at the check-out. The machine beeped as I was entering my credit card password. I asked the cashier to hang on. She stared at me quizzically as I assumed the position and stood in place as my arm buzzed and groaned and hissed. Afterwards I laughed and told her I was bionic. 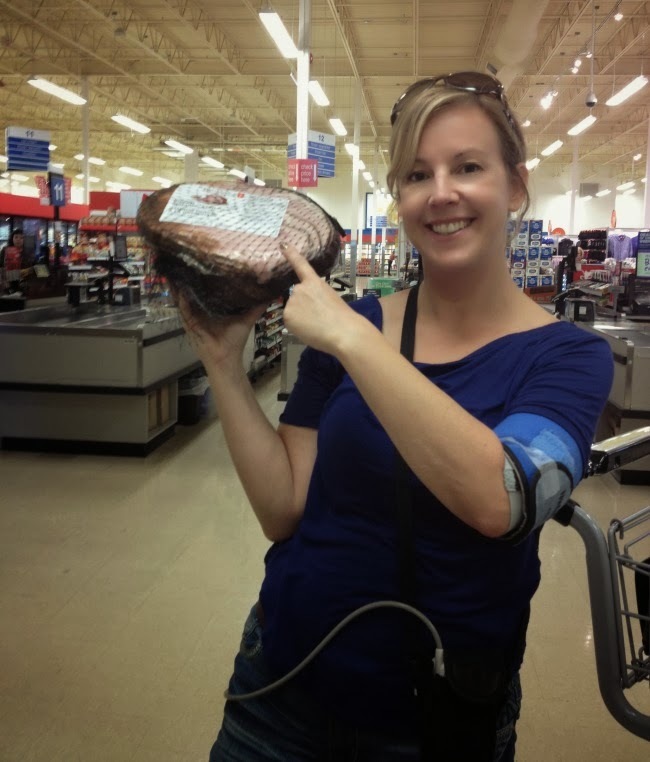 She stared at me blankly and said that since I spent the required amount, I was eligible for a free ham. “Great! That will help lower my blood pressure!” I joked. A few more errands and a night of tossing, turning and beeping later, and the test was complete. I returned the machine the next day and waited for the results. ….I’m on medication now. I’ve become accustomed to my gasket and I’d hate to see it blow. * Now what? I get my act together. I exercise. I watch my salt intake. I meditate and take deep breaths. I take measures to lower my stress level and learn to handle stressful situations better. Then, my doctor and I will decide whether I should stay on the meds or give it go on my own sans the little white pills.